Here are a few ideas on how to make this Advent and Christmas season more peaceful and meaningful for your family. Another day I’ll post some links to great ideas from other sites. This is huge. Crossing off all the to-do lists in the world can’t make up for not being present to our family. Don’t try to do everything, and make yourself crazy. Better a few things simply and cheerfully done, than so many done that we are frantic. Our kids will likely remember our friendly chats and little snuggles more than our elaborate craft projects, especially if the latter are done with impatience and anxiety. They want you and your love, not Martha Stewart. That goes for your husband, too. Help your children learn to give. They can find great joy in making cards for relatives or wrapping up some of their little toys to share with friends. Help them to think of the less fortunate. Let them help choose some toys and clothes to give away to charity. You’ll be surprised how generous they can be. Help them to give of themselves by calling relatives to wish them a merry Christmas. Hearing their little voices will likely make the day of the person they call. It’s easy to get so caught up in doing that we forget to enjoy. Take time to savor the memories you are making. Relish that tight squeeze from your toddler. Laugh at those silly antics of your five year old. Listen to that long story of your seven year old. Don’t check your email in the middle of it. This Christmas is like no other. Don’t take it for granted. It’s appreciating the present moment that gives life depth and beauty. Because we need to fill up our own well of love so we can pour it out on our family. When we try to run on empty, we deprive everyone of our best. If we take time to find peace, it will emanate from us. If we don’t, we won’t be able to help anyone else find it either. So light that Advent wreath candle, and spend a quiet moment staring into the flickering flame. Or pick up an inspiring spiritual book. Take a walk and admire the wonder of creation. Or even space out in front of the fish tank, watching these little slippery pieces of beauty dance about. Hey, it’s even good for your blood pressure, I’ve heard, which can be helpful in this busy season! 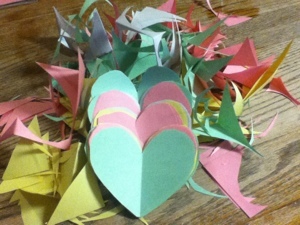 One thing we’ve done this year is cut up a bunch of paper hearts. When the kids do something nice like listen well right away, help a sibling, tidy up cheerfully, etc, we write it on the heart and tape in on our fireplace. Chalice also helps the children and families in the Philippines, so that’s another great option, after the typhoon. You could do something similar with any charity of course. The idea for the kids to focus on is that love makes the world a better place, and it’s mean to be shared. If we want our kids to have a truly happy Christmas, and not fall into the bottomless “ME” pit, we need to help them think of others. Cause love is something that doesn’t run out when we give it away. Sharing it by doing good makes it grow. Merry Christmas! God bless you all!